Loyola University New Orleans mourns a beloved member of its university community. 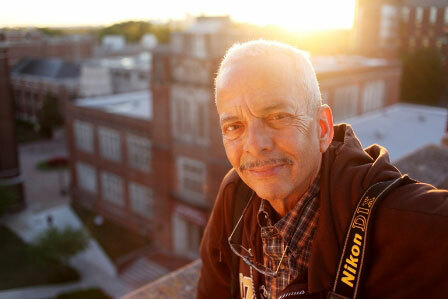 Award-winning photographer and longtime university employee Harold Baquet passed away Thursday following a seven-year battle with cancer. He was 56. Baquet is survived by his beloved wife, Cheron Brylski ‘80, and a large extended family with deep roots in the New Orleans community. “The epitome of a man with and for others in the great Ignatian tradition, Harold was a friend, mentor, co-worker, and legend to many on campus,” said Loyola President Kevin Wm. Wildes, S.J. Funeral services will be held on Wednesday, June 24 at Holy Name of Jesus Church, 6367 St. Charles Ave., with visitation hours from 10 a.m. to 12 p.m. in the church followed by a Mass of the Resurrection at noon. A reception on campus will follow. The entire university community will be invited to celebrate Baquet’s life. A private memorial for family will take place at a later date. For nearly 30 years, Baquet captured the unique events, people and cultural heritage of the city through his camera lens, immortalizing mayors, Archbishops, laborers, Mardi Gras Indians, street vendors, musical icons and college students with equal fervor. Early in his career he worked as a photographer for the City of New Orleans, capturing photos during the administrations of former New Orleans Mayors Ernest N. “Dutch” Morial and Sidney Barthelemy. A storyteller with a keen eye and a love for his city, Baquet showed a range in his work that was far-reaching and enormous – from photographs of riots in the 1960s and 1970s to a photo of a young Wynton Marsalis meeting his “idol” Miles Davis backstage. He documented destruction from Hurricane Katrina, which inspired his book, "In the Blink of an Eye: Photographic Memories of a New Orleans No More," co-written with his wife. Although his work appeared in museums from New Orleans to Chicago − and was published in local and national publications from The Times-Picayune to Rolling Stone − especially cherished on the Loyola campus was Baquet’s special way of connecting with students and the campus community. From 1989 until December 2014, he served as the university’s official photographer, chronicling the Loyola story through his photographs, which captured everything from incoming classes to building dedications and the recovery of the campus following Hurricane Katrina. His photographs are now preserved as part of the Special Collections of Loyola's J. Edgar and Louis S. Monroe Library. Baquet received the university's highest honors, including Loyola's Coadjutor Optimus award in 2002, the St. Sebastian award in 2007, and the President's Medal in 2010. In 2002, the Archdiocese of New Orleans awarded him the Order of St. Louis IX Medallion, which recognizes laypersons who have devoted themselves to the work of the church. In March, the university celebrated Baquet’s retirement with a special reception and photo exhibit in his honor. Students, faculty, staff, alumni and area residents posted messages of love and support on social media networks using the hashtag #loynolegend. In recent years, Loyola University has presented several retrospectives of Baquet’s work. At “Harold Baquet: A Retrospective,” a 2010 exhibit showcasing his work, Baquet, a member of a large and loving seven-generation Louisiana family, regaled and riveted listeners as he talked about his Louisiana roots, New Orleans culture, music, food, faith, politics and racial identity, among other topics, and shared photos of historic events and people he had documented through the years. In a talk presenting his work, he spoke to students about skills they should develop in order to become successful photographers. “He was the hip guy. He was the guy that never tried to be hip, that was always hip,” said John Rankin, a longtime friend and instructor of guitar and music industry studies who initially connected with Baquet, a fellow guitarist, over a mutual love of jazz. Weighed down by several cameras hanging around his neck, Baquet could often be seen walking across campus with a lanky strut, capturing photos of Loyola life and seeking out the personal in his photographs, Rankin said. Citing his friend’s “inner beauty,” he said that Baquet had a unique ability to connect with everyone he met − and to bridge any divide. “I don’t know of another person who was as beloved on campus and the support that everybody in the university offered him over the last few years was, I think, an expression of how much affection there was for him – and respect,” Biguenet said. Rankin and others spoke Friday of Baquet’s Christ-centered faith and unwavering devotion throughout his struggles with cancer. Through his seven-year battle with the disease, he remained upbeat and inspirational, sharing his experiences to help others, but never burdening anyone with his struggles.